"Tomb" is considered to be a full immersion adventure. It's fabulously made to test your wits in this mind-bending adventure of sights, sounds and action. Upon entering the "tomb", - it's like stepping into an Indiana Jones movie, where you will be in a simulated 3,000 year-old tomb with only your flashlight and your wits to guide you. 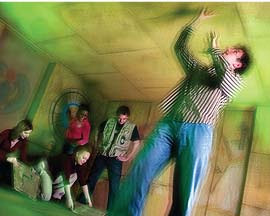 It provides a unique, walk-through interactive adventure experience using state-of-the-art special effects and mind-boggling riddles in a fantastic setting. This is a 45-minute adventure of excitement. You'll find yourself trapped by the spirit of an ancient pharaoh, faced with ingenious challenges that must be completed for any chance of making it out alive. If you have a large group, you must work together to find success in this battle of wits, or face the pharaoh's wrath! They said: - if you fail, death awaits! (LOL! of course, in reality it's NOT!). Consider yourself to be lucky just in case you happened to read this experience we've been through :). What I will be sharing is more than a clue to help you get the clearer picture once you are inside the tomb. 1st Chamber: Before stepping into the first chamber, you have to find a way to open that first door, of course! ( No clues on this part, pls!). Once you're inside, (your guide will be with you, don't worry), you'll be hearing pharaoh's instructions. You'll gonna find those lights that illuminates...(colored red). Play pharaoh's music. There will be 4 buttons with a corresponding pitch. By hearing pharaoh's music, you have to play those buttons correctly by following the correct tunes. Move the pyramids one at a time from box1 to box 2. This requires mind skills and technique. You have to do it fast as time runs fast. Or else, you'll be crushed with that ceiling as it goes down. Do the picture puzzle on the floor. 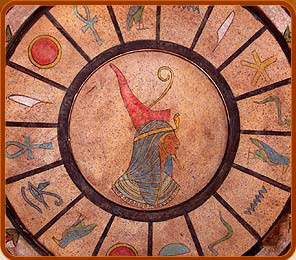 You have to complete the puzzle basing on the revolving puzzle on the wall consisting of symbols. This requires sharp eye skills as it is quite confusing. In our experience, we missed this one as our time ended too soon. So we were taken to a pipe puzzle on the wall which is much easier once you get the instructions. Symbol puzzles. You have to complete these puzzles on the four corner posts. Again, this requires mind and eye skills. This will be the final verdict! - it's the pharaoh's tomb. 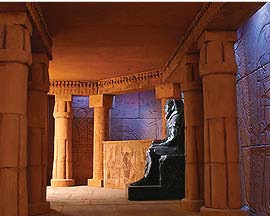 It's up to you to find way of illuminating pharaoh's face from a light coming from the outside. So, ... did you find yourself wittier than the others? Fun, isn't it?